I’ll get this out of the way first. I hate jump scares. 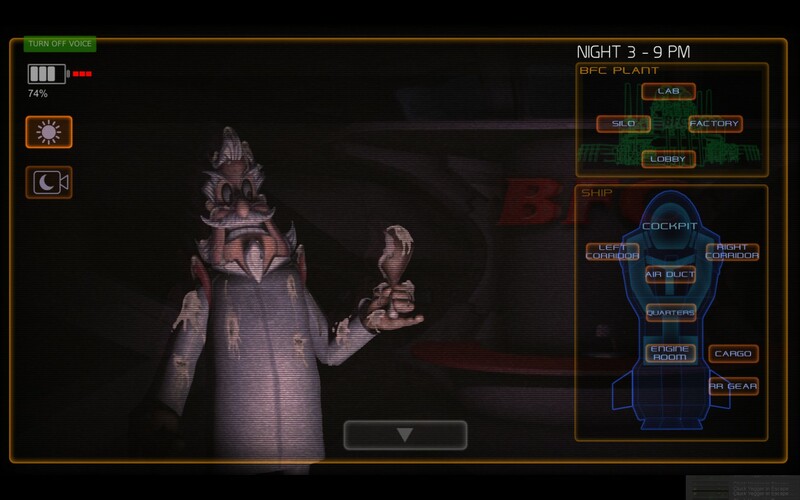 However, I was willing to give Cluck Yegger in Escape From the Planet of the Poultroids a good look because it was a mini-game being done by one of my favorite pair of adventure game creators, the Two Guys From Andromeda. Also known as Scott Murphy and Mark Crowe. Also, I was asked to help test the game to make sure that it was pretty much bug free before the public release. You can watch my playthrough of the first three nights below. A fair bit of warning, there’s a lot of swearing involved. Anyway, Cluck Yegger is a Five Nights at Freddy’s clone in the classic way that these two sultans of satire are known for. You play the obvious homage to Astro Chicken (look it up if you’re not familiar with the Space Quest series) as he crash lands on the headquarters planet of BFC, the base of operations for his nemesis Colonel Zanderz. Those familiar with these guys’ work should feel right at home here with all of the chicken and egg puns. True to its source material, you have four mutant chickens out for blood. Your blood. 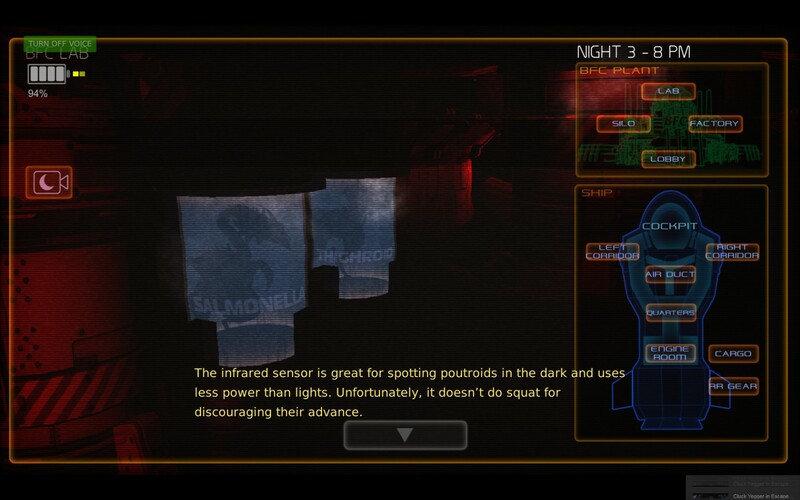 You have to survive a whole seven nights keeping these poultroid asshats from jumping you in your cockpit. Easier said than done. During my testing I had managed to almost make it through the first four nights before becoming chicken feed. Which is the furthest that I ever got and the furthest I’ll ever get. The few times that I played must have shaved at least a decade off my life between wondering where everyone is both in the facility and in the ship. The ambient noises don’t help and there’s a nasty storm brewing every evening that do weird things to your senses. And don’t get me started on the electrical discharges. Let’s just say that I had a bit of a discharge of my own. Cluck Yegger is the kind of game that you’ll want to play if you have the insane urge to scare yourself silly but still have a good share of comedy in your horror. It’s most certainly unconventional to see a bunch of fowls running around trying to peck your eyes out, especially since one is a giant baby chick known as Chickzilla. That’s the one that managed to get me at the end of the video, one that I knew was coming but I was too focused on the little guys running around the ship. As soon as I heard the pounding from outside I should have hit the shield button. I will point out here that thanks to Mark Crowe and Chris Pope I developed a deep phobia of fried chicken. I’ll never look at it the same way and for that I’ll never forgive them. At the same time, it was an honor to be a part of the development process even if it was just telling them every build that I hated them. Seriously, though, it’s worth playing just to get an idea of what to expect when SpaceVenture finally hits by the end of next year. And it’s cheap, with all sales going straight into developing the main game.